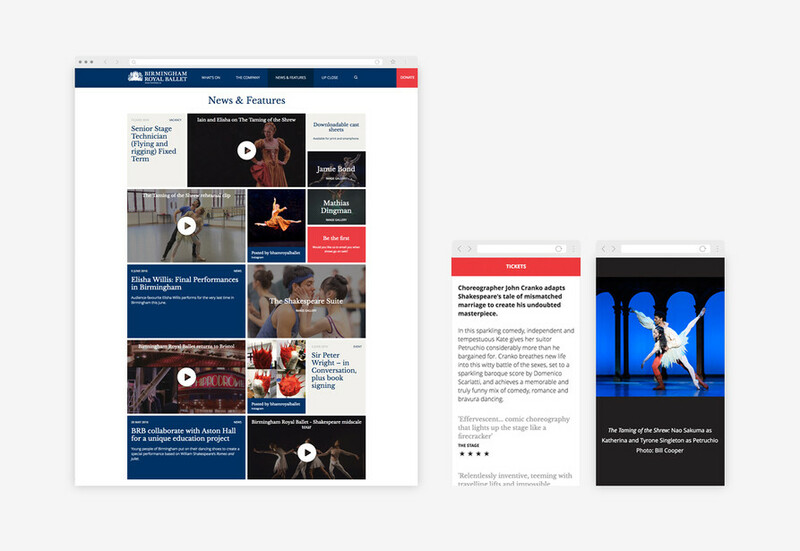 Birmingham Royal Ballet’s website is designed to make it easy for BRB to show-off their vast and varied content including interviews with dancers, educational resources, video snippets of rehearsals, and shots of the wig room. A flexible, customer-focused website, it allows the organisation to provide clear information about multiple programmes at multiple venues. Content can be linked together in all manner of configurations, allowing people to delve deeper than ever into the company’s work, and gain a better understanding of what goes on behind the scenes when creating large-scale, world-class productions. Despite containing this huge wealth of information, a carefully designed site structure means the website remains deceptively simple-looking and easy to navigate. Nifty details such as the venue locator (find BRB performances nearest you) and ‘sticky’ ticket buttons help to keep a website bursting with information neat, useful and usable. Supercool are a pleasure to work with; a collaborative, communicative team of problem-solvers. Our organisation has seen an increase in click-through rates of over 100%.